Every website needs a Contact form so that visitors have an easy online way to get in touch with you. 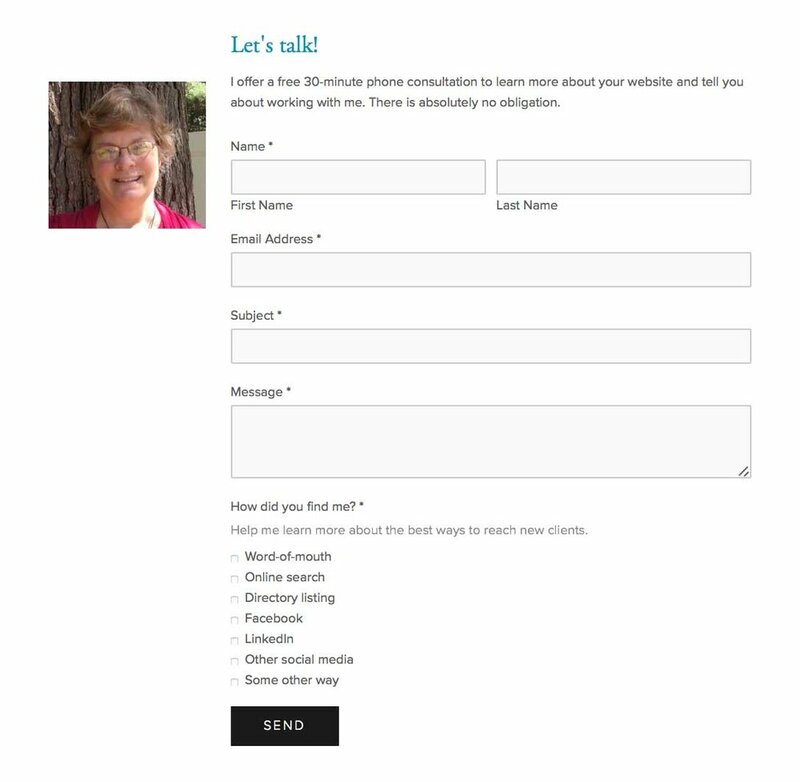 A Contact form is built into a regular website page. Although the page can have text and images as other pages do, what makes the page special is that it includes a form element. The form element allows you to add fields that visitors type information into so you can collect information that helps you respond to inquiries from potential and current customers. It also has a button that, when clicked, sends the information to an email account. All contact forms should collect First and Last Name, Email, Phone Number, and a place to write a message. You should set these fields as required, so you are sure you collect the basic information. Required fields are marked with an asterisk and the form can't be sent without the visitor typing something in required fields. A basic Contact form on a Services website collects enough information for the business owner to get in touch with someone who has questions about his or her work or wants to request a quote or schedule a consultation. A Contact form can also include additional fields to collect other types of information. These fields can be required, but they're usually optional. Here are two examples of Contact forms that request additional information. On my business website, I also ask how people found me to give me more information about where people are finding my business listing. I made this a required field because I wanted to be sure I collected the information. On JeanneVuralMassage.com, the Contact form not only asks which services the visitor is interested in, but also asks which appointment times are convenient. This gives Jeanne extra information to be able to finish setting up an appointment quickly. These extra fields are optional. Having someone fill out a Contact form to ask for an appointment or to ask questions is one of the main goals for your website. You should design your website so the Contact form’s page can be opened easily, preferably from more than one place. If you don't have too many other navigation links, you should add Contact as the last item in your navigation area. Robert Wright Woodworking & Restoration has four-page website with the Contact page listed in the navigation area. You can add buttons, images, or text links that open the Contact form page from different pages on your website. Buttons and images are more visible than text links, so if you have enough room, use buttons or images rather than text links. Buttons can say "Contact Me," but they can also be more specific if you are inviting people to take advantage of a free consultation or are asking people to schedule an appointment or RSVP to an event. A repeated button, image, or text link placed in the footer area of your website is a convenient way to remind people to contact you. Creating a Contact form for your website starts with creating a new page that matches the overall design of other pages on your website. The page should have a title and brief text that invites visitors to fill out the form. Some business owners also add the business name, address, phone number, location map, business email address, and social media links, showing other ways to be in touch with the business. The Contact form that visitors fill out is created with a form element, to which you add different types of fields. For each field you add, you decide if it is required or optional. Every Contact form gets a button. I usually name the button "Send." But the most important part of the button setup is indicating which email address the form should be sent to. This will generally be your business email address. When forms come in from your website, they will be labeled as coming from your Squarespace or Weebly website and will have all the answers that the visitor provided on the form. It will be up to you to respond promptly by phone or email to follow up on the inquiry. Having a website is all about connecting with potential and current clients. Having a Contact form that makes it easy for those clients to get in touch with you is an essential part of any business website.